This hand-carved shisham wood figure is the perfect companion for keeping your glasses handy. A group of craftsmen in India is trying to help you find your glasses. 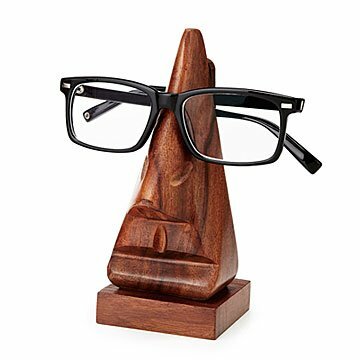 This hand-carved wooden statuette is perfect for holding your glasses when you're not using them. No more searching around blindly, or trying to remember where you last put them down. And this friendly face also has a story to tell: it was created by HSSS, a non-profit in India that helps underprivileged artisans, who suffer hardships with physical handicaps, illiteracy, extreme poverty, or being in lower castes, find markets for their wood products. Handmade of sustainable sheesham wood, native to the Indian subcontinent, bought under supervision and quota from the government of India (which sells the wood of dead trees). Visit the blog to learn more about how these handcrafted pieces are made, and how our partnership is making a difference in the lives of the artisan communities. Came in broken but it was broken but is still able to work so it's ok!! I got it for my dad, who now has multiple pairs of glasses. The holder is super fun in design, but the wood makes it subtle enough to fit in with most decor. Great gift for anyone, for any holiday! Great for holding glasses. Used on a desk at the office. I can't say enough for the utility and the laughter this nose has brought into our home. I saw this and asked for it as an Xmas gift thinking it would help my never-ending issue of misplacing my glasses. I love it! So much so that I've purchased 2 more so that I can have one at the office and one by my bed. I bought this for my son who just got glasses for the first time. Not only will it help him keep his glasses safe when he's not wearing them but it's stylish for his living room. Nice quality and a unique gift! Well-made and functional product. Doesn't hurt that it's a bit of a conversation piece as well. Discovered that you can actually store two pairs at a time. We could use one for each room in the house!